Every year millions of people invest their money into gold, oil, and precious metals, yet diamonds are a virtually unexplored financial asset. With the diamond industry having an estimated valued of $80 billion annual turnover, diamonds are primed to become financial investors next treasure trove. – Stability of Value: diamonds are a safe investment in that they maintain their value even in economically uncertain times. Much like gold, diamonds remain unaffected but drops in the financial markets and unlike cryptocurrencies and other newer investment opportunities, the nature of diamonds as a tangible asset with significant lifespans, secure their value where other investments may diminish over time. – Diamonds have both practical value with their use in industrial production as well personal value as signifiers of wealth and commitment to those who buy them as jewellery, gifts and engagement rings. – Diamonds are extremely high value for their weight and volume, meaning they are easily transported and stored. With so many advantages to investing in diamonds, the question then becomes why aren’t more people doing it already? At a FinTech Meet-Up in Tel-Aviv last November, CEO and Co-Founder of CEDEX, Saar Levi, pointed out why investment in diamonds has always been limited by three key factors; a lack of transparency in the market, a lack of liquidity oversupply and demand and finally a lack of standardization with the value of stones. Levi, along with his team of heavyweights in the diamond and finance industry, have set the task to eliminate these limitations with their new and exciting CEDEX Diamond Exchange. CEDEX is the first ever certified Blockchain based diamond Exchange. It aims to fill the gap between the existing diamond industry and the growing financial investment market. CEDEX is the brainchild of Saar Levi and Ronen Priewer who boast a combined total of over 35 years of experience in global financial markets and the diamond industry. They have formed a team of highly experienced experts in the fields of finance, marketing, blockchain software development and diamond trading. CEDEX is set to revolutionize the way people deal in diamonds and give traders and investors the confidence to buy and sell diamonds without needing to spend years of their lives on researching the industry. On the 16th March 2018, CEDEX will be launching its CEDEX Coin with an ICO Token Pre-Sale. Due to unprecedented interest, the pre-sale amount of tokens available has increased to 50% of the total. This ERC-20-compatible token will act as the only form of currency accepted on the CEDEX Exchange. As well as purchasing of diamonds, the CEDEX Coin can also be used in a number of ways within the diamond industry, including for the payment of insurance costs, transaction fees and custodians fees for holding of diamonds. An important advantage of the CEDEX exchange and CEDEX Coin is that traders and investors will be able to buy individual diamonds, shares on a basket of diamonds (EFT) or a share in a single high-value stone, expanding the possibilities of investment. CEDEX potential has not gone unnoticed by others in the investment industry. One of the earliest supporters of CEDEX has been TechFinancial, a public company traded on the London Stock Exchange, who became a 90% majority shareholder of the company. TechFinancial has pledged to support CEDEX both financially as well as assist with resources, workforce and experience that they have available to grow the enterprise. With the use of the CEDEX solution, we are seeing a realistic way to combat the issues of Transparency, Liquidity and Standardization that have kept investors away in the past. With the deployment of the CEDEX’s sophisticated machine learning algorithm, the DEX, alongside the CEDEX Exchange and CEDEX Coin, these issues will no longer be valid within the diamond industry. The DEX is used to create an output market value for each stone registered on the CEDEX Exchange. It does this by taking into account three major components of diamonds; the gem composite of each stone on the market, parallel trades being carried out on the exchange and current trends in the market. In this way, CEDEX will be able to Standardize the value of diamonds based on supply and demand rather than relying on human expertise in diamond appraisal. Transparency will also no longer be a concern thanks to the data collected by the CEDEX Exchange and the implementation of blockchain technology. With each transaction accounted for and accessible to anyone, the origin and previous selling prices of stones are clearly defined. By creating an accessible database of information on each stone on the CEDEX Exchange as they are traded and valued, a new level of transparency will be achieved. 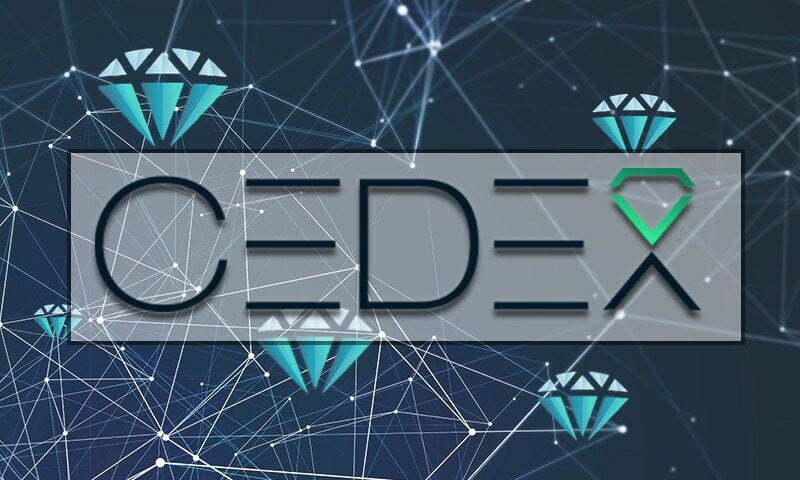 The final hurdle, the lack of liquidity, is overcome with CEDEX’s new partnership with IDEX, the worlds largest online diamond exchange, CEDEX will gain access to a user base of over 7000 diamond dealers from all over the world. This will help increase the supply of diamonds to the market. Supply will see further improvement as private diamond holders, who had previously been excluded from the industry, will now have a safe way to value their stones against the current market using the DEX, and trade safely without having to become an expert in the field. We are entering a very exciting time for the diamond industry, which the people at CEDEX suggest will see the formation of diamonds as the next financial asset class. If you are interested in keeping up to date with CEDEX you can follow them on Telegram, Twitter and Facebook. Additionally, if you would like to learn more about its ICO launch on the 16th of March 2018 as well as test out the DEX algorithm with any diamonds you already own, these can be found at www.cedex.com.